Back in March, we noted that Wikimedia was suing the NSA over its mass surveillance program under Section 702 of the FISA Amendments Act. This is the part of the law that the NSA uses to justify its "upstream" collection -- which lets the NSA partner with backbone providers like AT&T and tap their fiber lines at entry/exit points from the country and sniff through all the traffic. The problem in many lawsuits concerning NSA surveillance is that it's been difficult for the plaintiff to satisfy the requirements necessary to get "standing." That is, can the plaintiff prove that he/she/it had rights violated by the program. Many earlier attempts failed, because they just presented stories of "well, the NSA is collecting everything, so..." and the courts have said that's not enough, since it needs to be shown that the plaintiff, in particular, was a target. Wikimedia (and the ACLU, who is helping with the case), believed they had a smoking gun that could grant them standing. 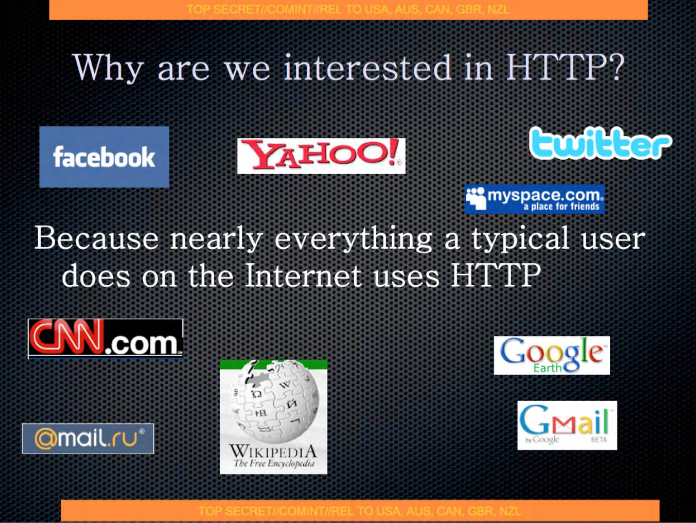 The following slide, which was revealed by Ed Snowden: See that Wikipedia logo? Wikimedia Foundation and the ACLU argued that this presented evidence that the NSA was targeting Wikipedia users, and thus the Wikimedia Foundation had standing. Unfortunately, so far, it's not working. Earlier today, the court tossed out the lawsuit, saying that Wikimedia did not present enough evidence to prove it has standing. The court, not surprisingly, relies heavily on the Supreme Court's ruling in Clapper v. Amnesty International, in which SCOTUS rejected Amnesty's similar claim by saying the organization failed to prove it had standing, since it couldn't prove its team was caught up in dragnet surveillance. Of course, famously, to get to that ruling, the US government flat out lied to the Supreme Court (something it has since admitted), claiming (incorrectly) that if information collected via such surveillance was used in criminal cases, the defendants would be told about it. But, no matter, the court says that under the Clapper ruling, Wikimedia does not have standing, and basically argues that this case really is no different than that one. It rejects the idea that, thanks to Snowden, we now know a lot more about the NSA's surveillance program, basically saying that it's still too speculative. Plaintiffs cannot provide a sufficient factual basis for their allegations because the scope and scale of Upstream surveillance remain classified, leaving plaintiffs to prop their allegation of actual injury on suppositions and speculation about how Upstream surveillance must operate in order to achieve the government's "stated goals." Indeed, plaintiffs cite the government's "stated goals" in nearly every facet of their argument.... It is, of course, a "possibility" that the NSA conducts Upstream surveillance in the manner plaintiffs allege, but this "bare assertion" is unaccompanied by "factual matter" that raises it "above a speculative level," and hence does not establish standing. The court notes that the "speculative chain" may be "shorter" than in the Clapper case, but "it is a chain of speculation nonetheless." ... plaintiff's contention that "about surveillance" is like the hypothetical government agent reading every piece of mail misses the mark. Unlike the hypothetical government agent reading every word of every communication and retaining the information, "about surveillance" is targeted insofar as it makes use of only those communications that contain information matching the tasked selector. In short... it's not a problem that the NSA sniffs through everything to find all the emails about Osama bin Laden, because it's not using the data in all the ones it rejects. Besides, the court argues, the argument is still highly speculative. The court is probably right here. There are two major surveillance programs under 702. The "Upstream" program that taps the backbone and then PRISM, in which a list of big internet firms agree to hand over certain information pursuant to a FISA court ruling rubber stamp telling them to hand over that information. And it is actually likely that the part of 702 that was used on Dratel's clients was of the PRISM variety. But the "well, you were surveilled under this other program using the same authority..." reason to dump this argument seems pretty weak. Because it still means surveillance of dubious legality under the same legal authority. Plaintiffs' argument is unpersuasive, as the statistical analysis on which the argument rests is incomplete and riddled with assumptions. For one thing, plaintiffs insist that Wikimedia's over one trillion annual Internet communications is significant in volume. But plaintiffs provide no context for assessing the significance of this figure. One trillion is plainly a large number, but size is always relative. For example, one trillion dollars are of enormous value, whereas one trillion grains of sand are but a small patch of beach. Here, the relevant universe for comparison purposes is the total number of annual Internet communications, a figure plaintiffs do not provide--nor even attempt to estimate--in the AC. Without defining the universe of the total number of Internet communications, it is impossible to determine whether Wikimedia's alleged one trillion annual Internet communications is significant or just a drop in the bucket of all annual Internet communications. Moreover, plaintiffs conclude that there is a greater than 99.9999999999% chance that the NSA has intercepted at least one of their over one-trillion communications on the bases of an arbitrary assumption, namely that there is a 0.00000001% chance the NSA will intercept any particular Internet communication. Plaintiffs provide no basis for the 0.00000001% figure, nor do they explain why the figure is presented as a conservative assumption. Plaintiffs seem to presume a string of zeroes buys legitimacy. It does not. Indeed, a closer look reveals that the number of zeros chosen by plaintiffs leads conveniently to plaintiff's desired result. If three more zeros are added to plaintiffs' figure (0.00000000001%), the odds that at least one of Wikimedia's one trillion annual communications is intercepted drops to approximately 10%. If four more zeros are added (0.000000000001%), the odds that at least one of Wikimedia's communications is intercepted drops to 1%. In short, plaintiffs' assumption appears to be the product of reverse engineer; plaintiffs first defined the conclusion they sought--virtual certainty--and then worked backwards to find a figure that would lead to that conclusion. Mathematical gymnastics of this sort do not constitute "sufficient factual matter" to support a "plausible allegation." The court also rejects the idea that this kind of ruling means that the Upstream program can never face judicial review, pretending that the fact that the FISA court reviewed it (without any adversarial party) is enough... and (again, incorrectly) that criminal defendants prosecuted with information collected under the program can challenge said collection. And, yes, it's true that the DOJ has now said that it will start informing defendants, but it didn't for years. The ACLU is, not surprisingly upset by the ruling, and I imagine it will be appealed soon. Isn't it strange how the judges bend over backwards to 'understand' technology in the way the more powerful party needs it? When talking copyright, they don't mind arguing that a browser cache (in the computer's RAM) and the the browser cache (on the hard disk) constitute illegal two copies in addition to the real copy in iTunes that was licensed. You lose - breach of copyright. When talking NSA, storing ALL data on an NSA-server - no problem. Machine-analysing all of these data - no problem. Plaintiff's logo on an internal presentation - no problem. Unless you can prove a human analyst actually reads the document - no standing.